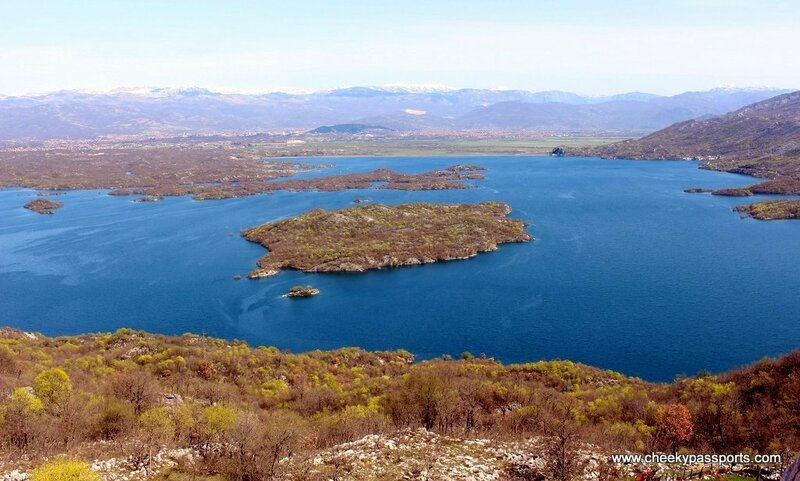 The drive from the border to Nikšić, Montenegro’s second largest town, was uneventful except for a photo stop at a view point over a spectacular lake framed by the city and mountains in the distance. I felt that Montenegro would be easy to like. 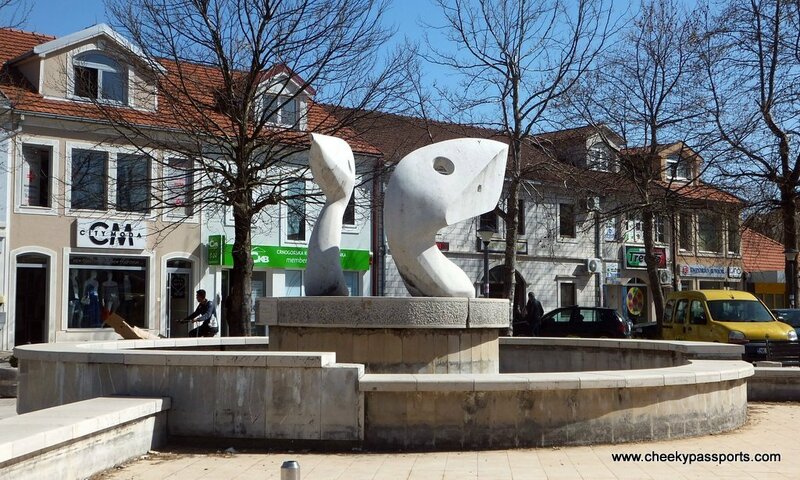 Our stop in Nikšić served mainly as a break for Nikki who had already been driving continuously for quite a few hours. Still, we thought that we might as well take a walk round the town. Parking the car seemed to be a complicated affair. We understood that we needed to send an SMS in order to pay for parking but we assumed that it applied to locals only. Luckily we found a young man who spoke English and who explained that there was another method of paying for parking fees, although he himself wasn’t too sure about it since nobody used it. He took us to a tobacconist’s shop and they discussed the situation for a little while and agreed that we should purchase some parking vouchers to leave on the car’s dashboard instead of sending the SMS. The tickets cost Eur 0.30 each and were valid for an hour. We thought that this was very inexpensive considering we were parked right by the main square. There wasn’t much to see in Nikšić so we settled for some iced coffee and pancakes and headed out. 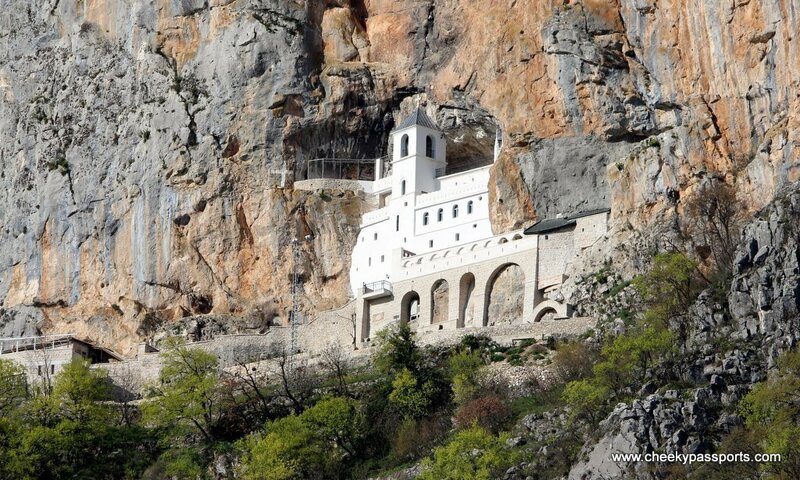 Our next stop was the Ostrog Monastery. Back home when planning the trip, we had debated (argued) about whether we were going to have time to make the detour to go see the Ostrog monastery especially since this is what the road up to it looked like on Google Maps (see left). But my powers of persuasion are legendary (Nikki would translate to nagging) and with the promise of a large dinner and ice-cream, I did actually manage to convince him to drive up. The Ostrog Monastery is a Christian Orthodox Monastery cut into a vertical cliff face and is a popular pilgrimage site for many local and even non-local believers of various faiths. 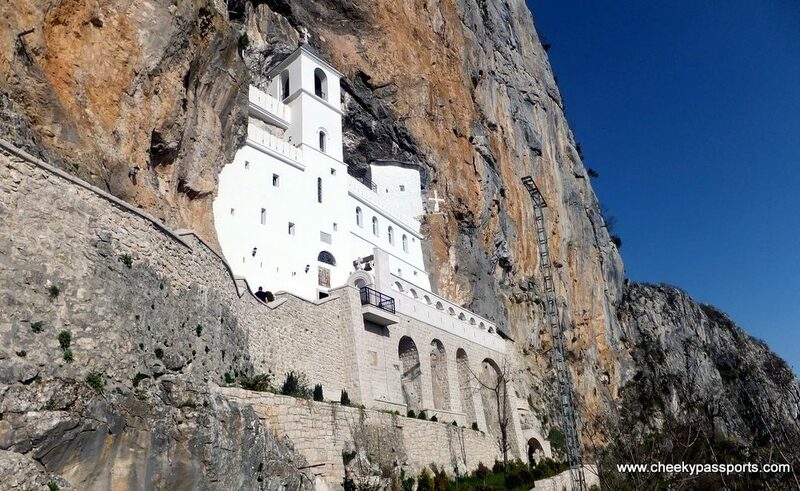 There’s actually two monasteries and some pilgrims walk from the lower one to the upper one barefoot. We stopped at the lower one and then drove all the way up to the upper one. Apparently you’re not usually allowed to do that but despite this destination being supposedly very popular, there were perhaps five people besides us in the entire place and nobody stopped us.The drive to the monastery was the scariest one in the entire trip. The mountain path is really narrow with no guardrails and trying to manoeuvre our way around a car going in the opposite direction was almost traumatic. My terrified screams every few seconds didn’t help Nikki much either but he totally retained control! 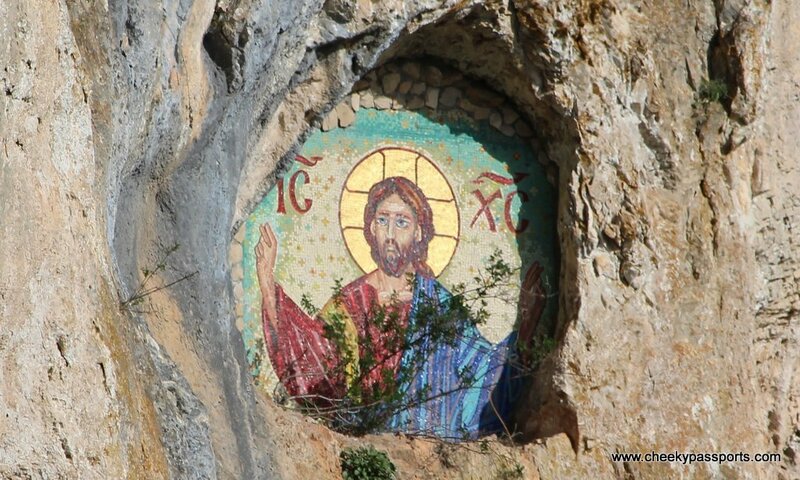 The upper monastery contains two cave chapels and some mosaic images and there’s an impressive view over the valley below it. There was a definite aura of serenity and peace which I think is more related to the dramatic surroundings rather than having any kind of spiritual implication. This is probably completely overshadowed by the hordes of pilgrims at the site during peak season. 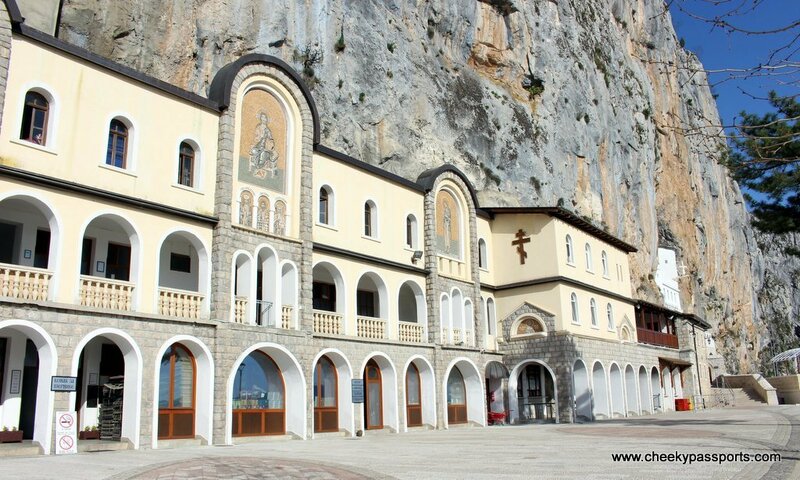 The lower monastery consists of a church and a residence for monks and there’s also a dormitory for pilgrims. Long trousers/skirts and covered shoulders are a must if you plan on entering the monastery. 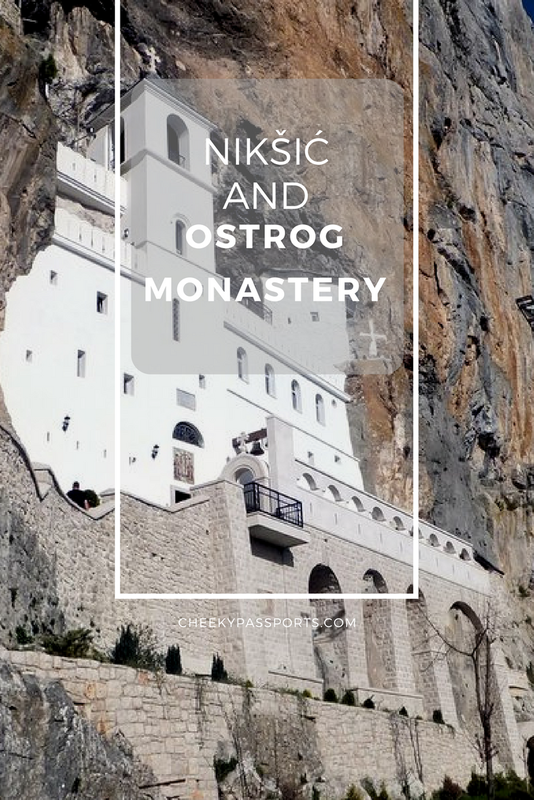 If you’re not driving, day trips to the monastery are available from all major towns in Montenegro or else you can take a bus directed to Nikšić and tell the bus driver to stop you at the stop closest to the monastery, about 8km away. If you’re walking, be sure to wear your most comfortable pair of shoes and to carry lots of water!